Located in Yangmei Taiwan, Goodwill Fiberglass Corp. is a professional FRP manufacturer. 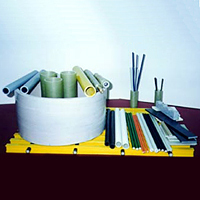 Our products are made by Pultrution, Filament Winding, SMC BMC and Hand Lay Up. These products can be applied to wide range of usages such as civil engineering, telecommunation, transportation, medical, sports and so on. We also take orders of customized new products to help cut down the cost for our customers.